Authorized dealer of Luxaflex® blinds in UK, Fit-ex offer conservatory blinds for roofs and windows. To be able to use and enjoy your conservatory all year round, through roasting hot summers or frosty cold winters it is important to have a window dressing that protects your furnishings as well as aid in the controlling of temperature within your conservatory. Pleated blinds are the most suitable solution for conservatory roofs as they can be made to fit any of the unusual shapes encountered. 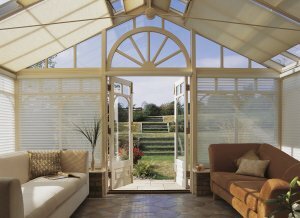 Coordinate these with other conservatory blinds types to help you create the perfect setting. For roofs, the best fabric is called “Duette”, the Luxaflex “Honeycomb” effect material with the best insulation and heat retention and heat reflective properties for summer.